Plie is a brand you can trust for school. Waterproof Sleeveless fabric for the ultimate in clothing protection. Polyester, Waterproof Sleeveless coating. Imported. Hand wash. Made of Plie easy wipe Waterproof Sleeveless fabric. 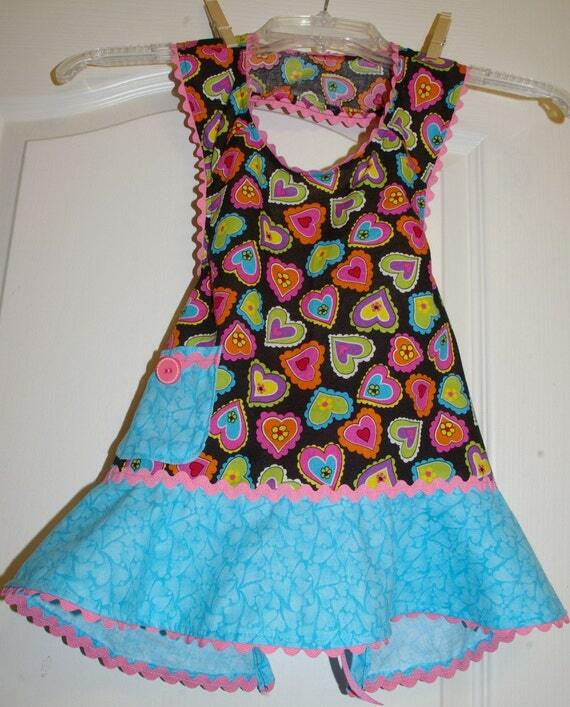 Reversible Children’s Craft Apron has heart pattern on each side.Made of 100% cotton. 25.5″ from bib to hemline. Adjustable straps. 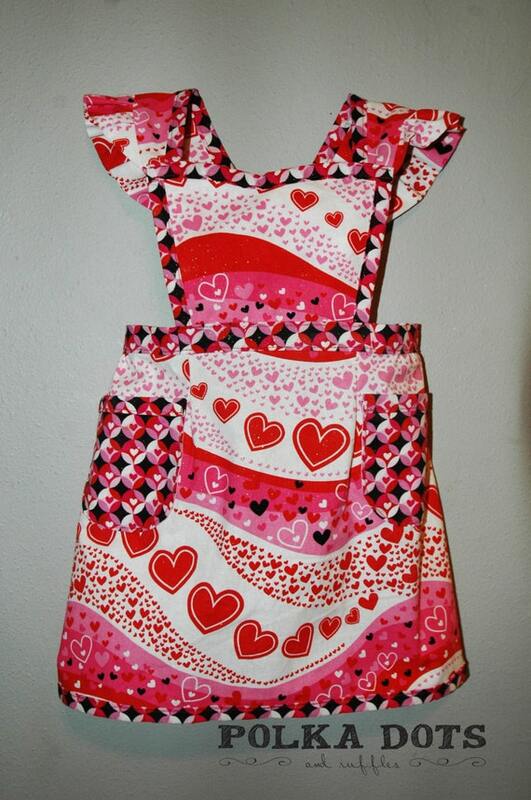 Valentine Child Heart Apron size 3-4. 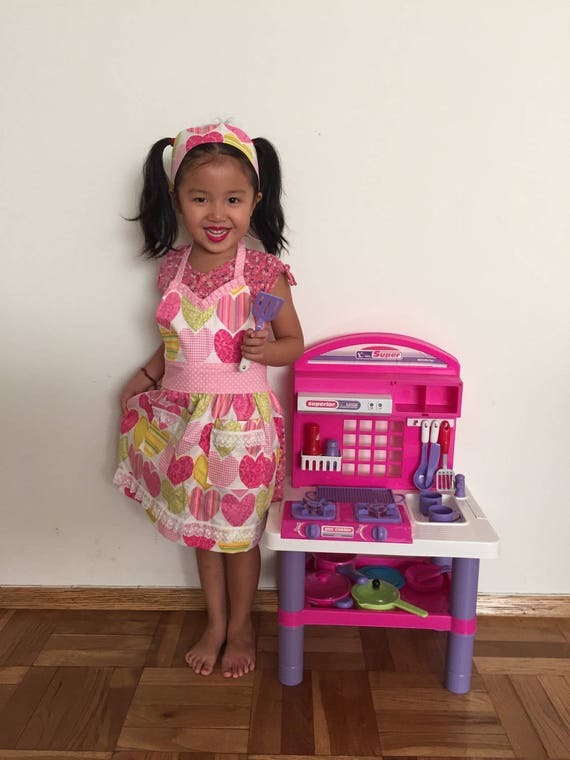 Darling for your child to wear helping with dishes, meals, pretend play, making cookies or just for dress up. Great gift idea! 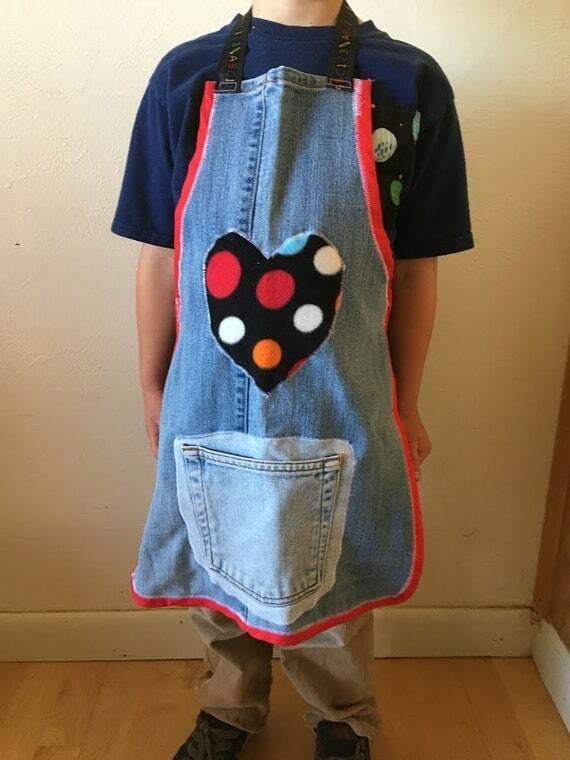 Our reversible apron is perfect for pretend play, arts & crafts, or of course helping mom or dad in the kitchen. Like getting 2 aprons in one! Our aprons are made from colorful grosgrain ribbon and 100% cotton fabric. Fabric has not been prewashed so some shrinking may occur. Recommend washing warm and dry on low heat setting. Smoke/pet free studio. This apron is 65% polyester and 35% cotton. It features an embroidered Heart on the bib. It also has 3 handy pockets at the bottom of the apron. 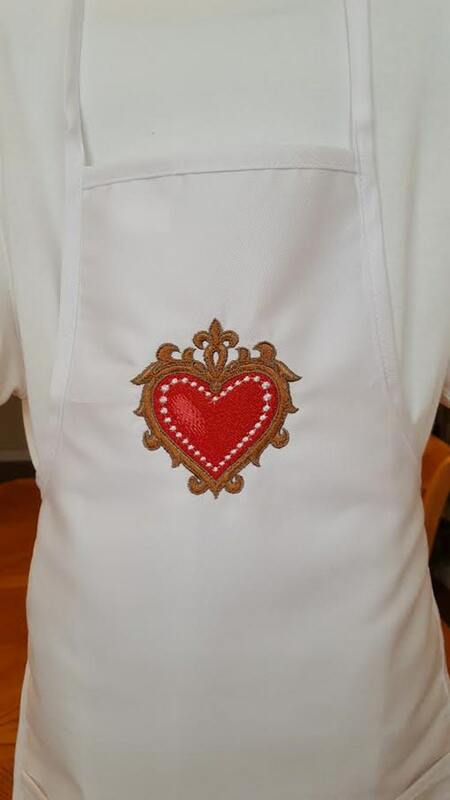 The apron itself was bought and then I machine embroidered the heart. The apron size is a 4+ and measures about 13″ x 19″. I have had parents and grandparents buy these for kids 2 1/2 to 8 years of age. 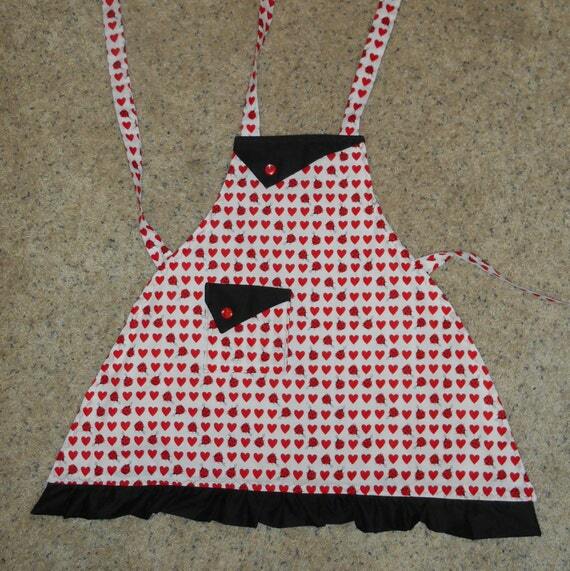 This adorable child’s apron features a hearts and ladybugs theme print. It has a pocket and a cute ruffle at the bottom, with black contrasts . It has adjustable ties at the neck and waist. For added durability and structure, all of our aprons are completely lined on the back. This apron comes in two sizes, a smaller and a larger size. The smaller size will fit approximately 2-6 years old, and the larger size will fit approximately 6-10 years old. There is a matching “mother” apron available in the same print. 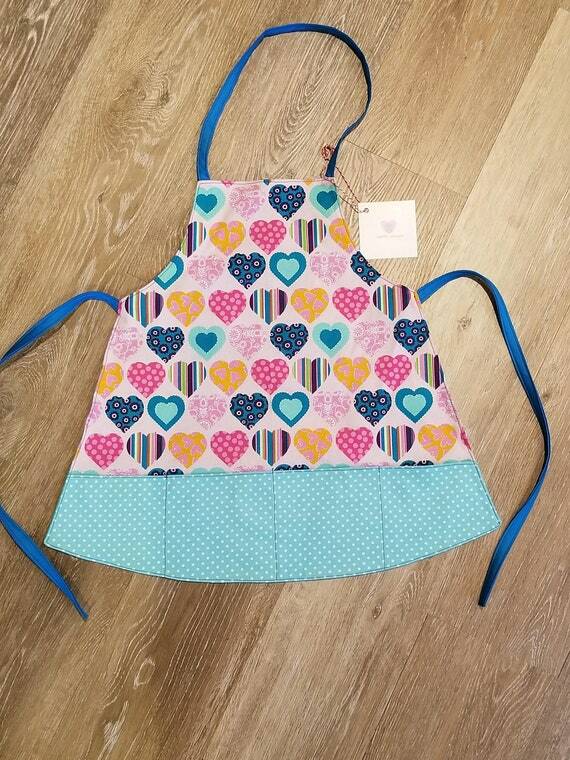 This cute adjustable child’s apron is perfect for your little cook! The long pull through tie makes it fits several sizes. It will fit a long time as the neck strap adjusts through a casing to lengthen or shorten to fit perfectly. 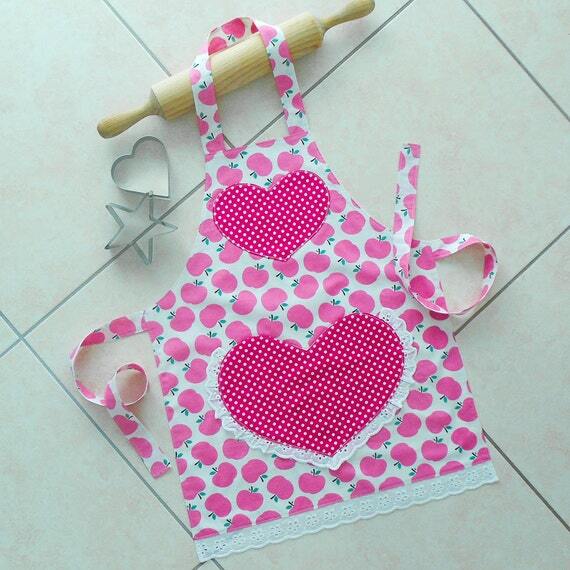 Girls Apron Pink, kids & toddlers kitchen craft art play apron, child lined cotton apron, pink apples and polka dot apron, heart lace pocket. Made from quality fully washable light weight 100% cotton fabric and lined in white cotton. The fabric is pre-washed and seams are top stitched for extra durability. They come in pink apples on a white background for main body and white spots on a hot pink background for pocket & applique. I have added Broderie Anglaise lace for that extra “sweet girlie” look. Also have a lined heart shaped pocket with a little applique heart on the bib. 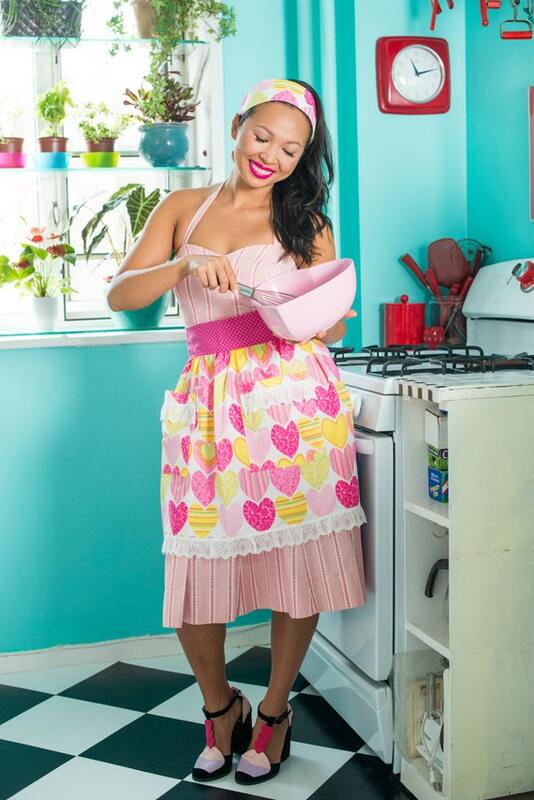 The gathered skirt of the apron is in a red/pink heart terry cloth and is complemented with soft pink glittery fabric for the pocket and waistband. Adding to the charm of the apron is the detail in the lace and ribbon trim work. There is one square pocket with the same emblishments. Also note the heart stacked buttons centering the pocket. This is a child size small or medium. 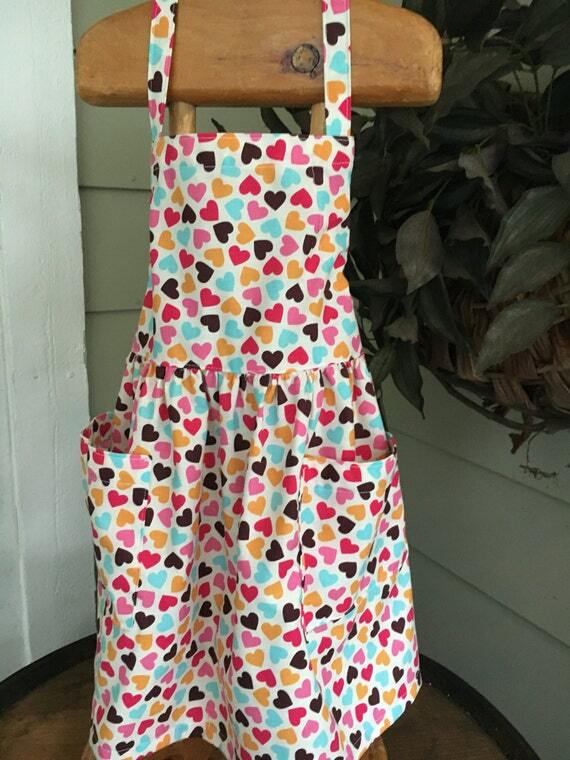 This adorable apron has 2 pockets in front and a ruffle on each shoulder strap. The straps cross in back and attach with an adorable heart button. The top of the apron is a sweetheart neckline and the waist circles around and ties in back. Heart on Heart cross front apron with a waistband that ties in the back and at the top. Order as shown or choose your own fabric for Valentine’s Day or any color combo you could want. 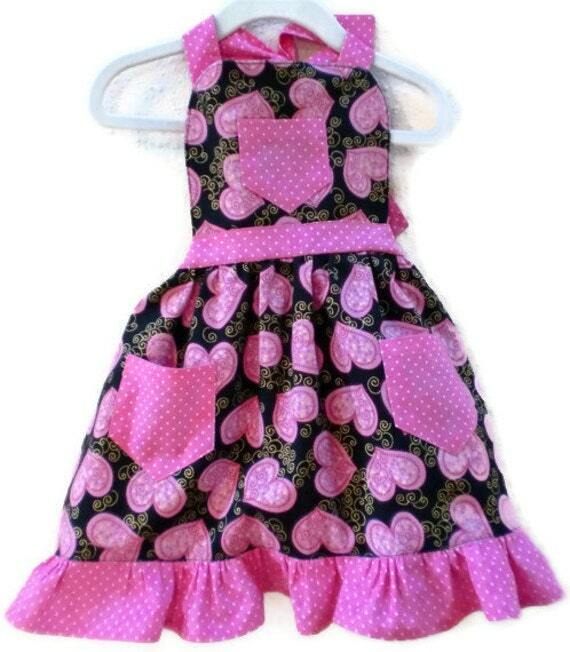 Adorable heart applique aprons for girls or boys! 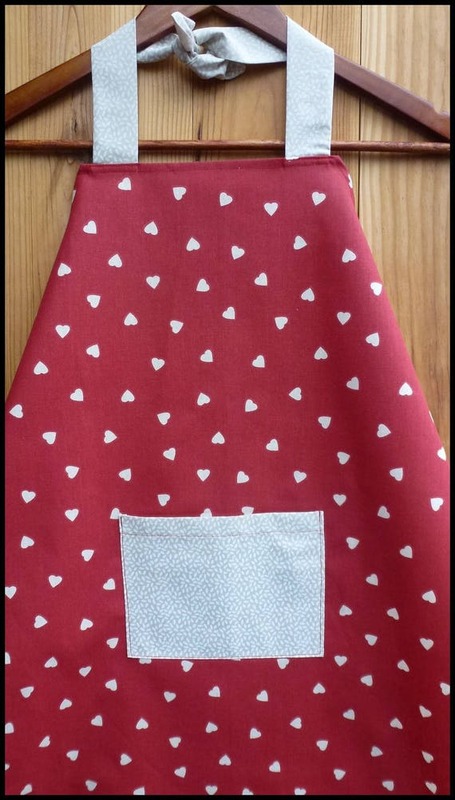 Our sample apron was made using a fabric heart applique. 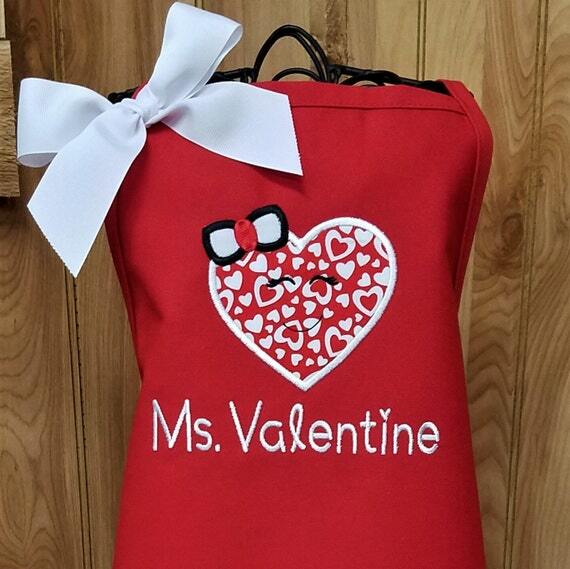 Personalized with Ms. Valentine or Mr. Valentine or name. You choose the apron color & color of thread for the monogramming. 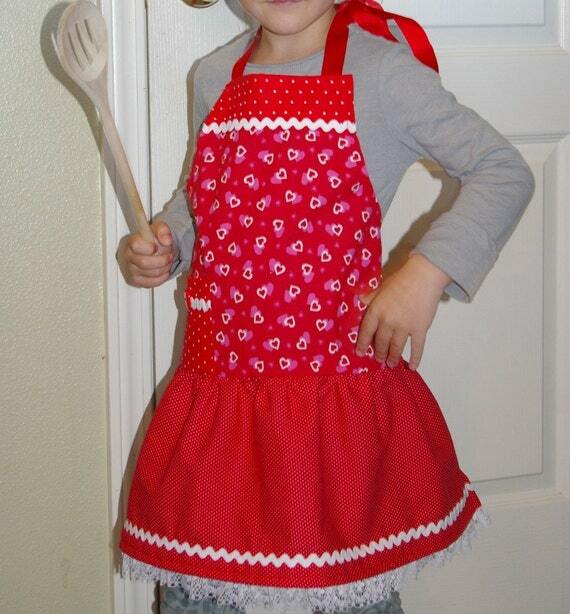 The child’s bib style apron has 2 front pockets, very durable, & stain resistant. Made from 7.5oz 65/35 poly/cotton twill fabric. Neck strap can easily be tied in a knot to shorten. 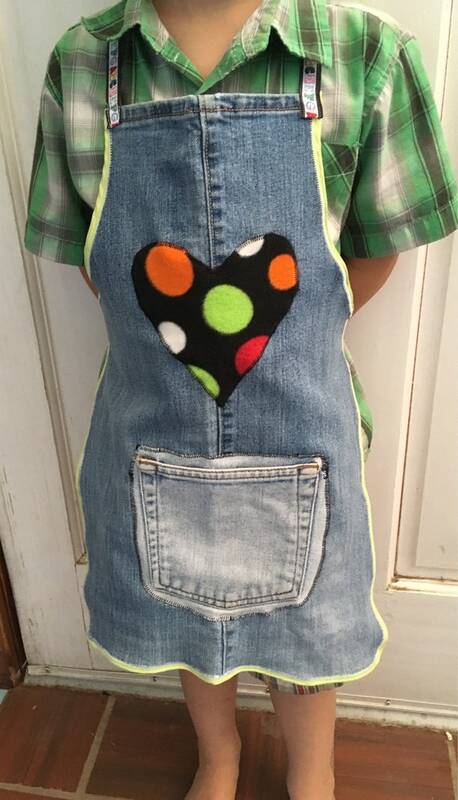 Kids aprons make great gifts! Sizes are approximate. 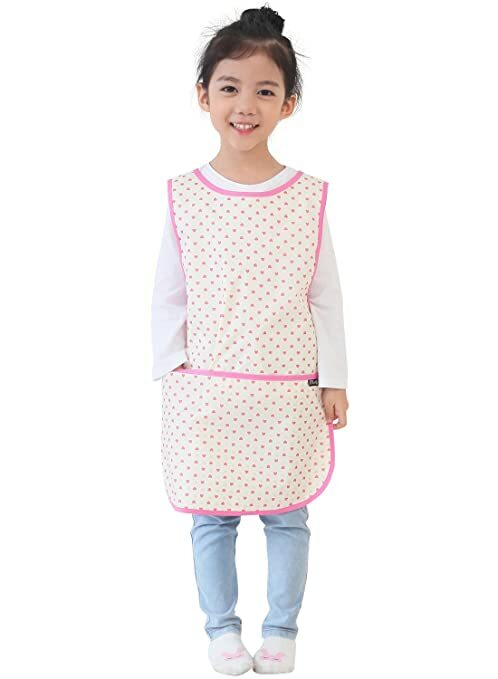 Choose the apron size that best works for your child. 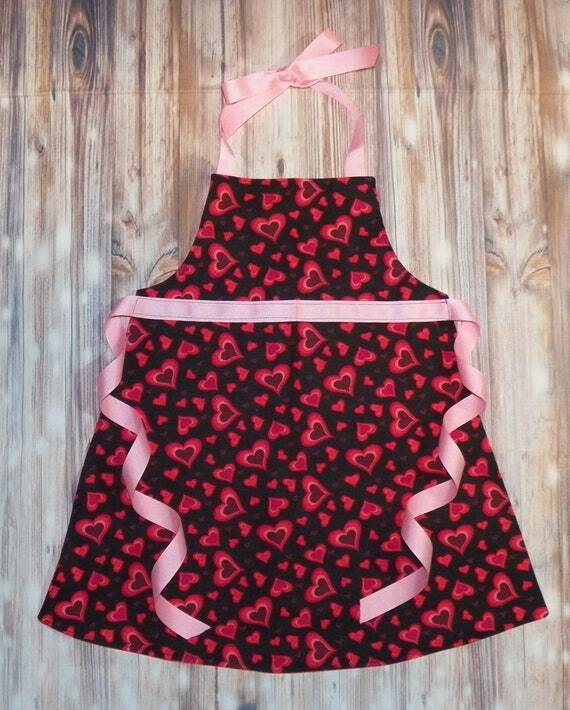 Child’s heart apron perfect for a Valentine gift! 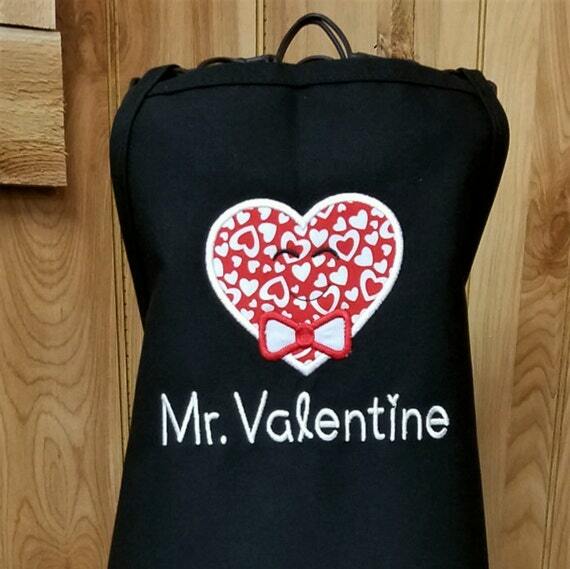 Apron can be personalized with a name instead of Ms. or Mr. Valentine. Heart applique design is placed center front. You choose the apron color & color of thread for the monogramming. 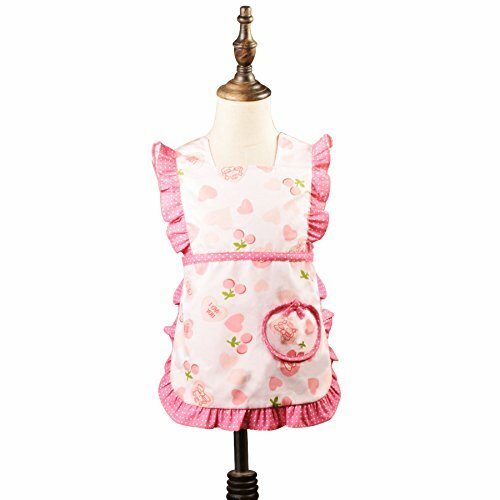 The child’s bib style apron has 2 front pockets, very durable, & stain resistant. Made from 7.5oz 65/35 poly/cotton twill fabric. Neck strap can easily be tied in a knot to shorten. 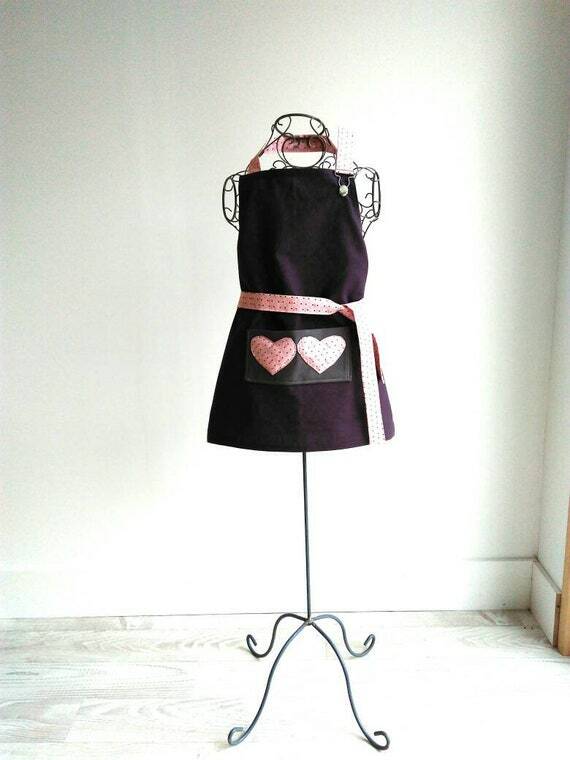 Kids aprons make great gifts! All kids love to be in the kitchen with you! Make them feel even more special with a custom made apron! Apron has an adjustable tie strap. Simply loosen by gently pulling on the neck strap. Tighten by pulling on tie straps. Perfect comfortable fit! 16.5” from top to bottom of apron front. 12” across. Strap is plenty long. 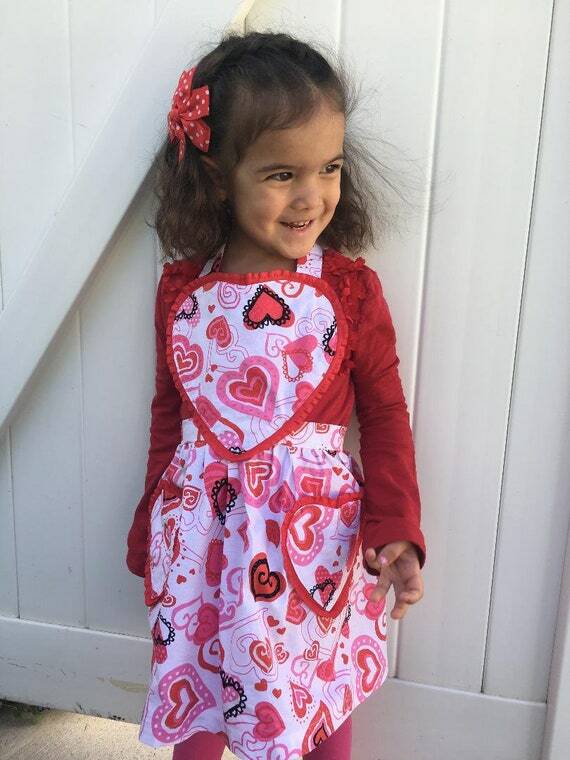 This adorable and fashionable Child’s Valentines Heart apron is designed with creative kids in mind. So they can cook and craft in an apron they love and save the cloths you love. 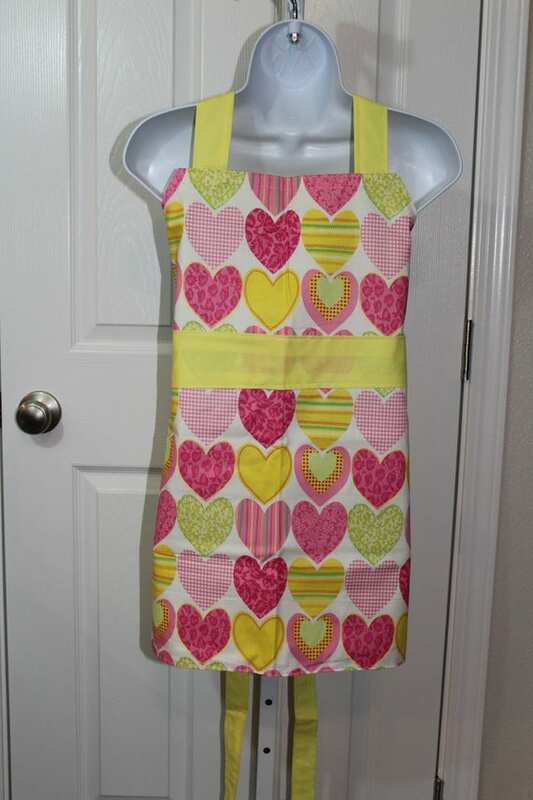 This apron will fit a size 5-10, it is made from 100% cotton and has a solid Yellow backing. 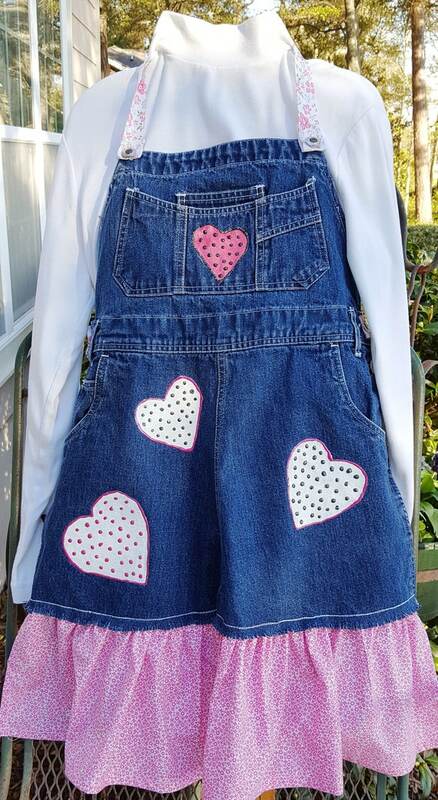 Handmade Love Hearts Toddler Kid’s Baking or Craft or Messy Play Apron. 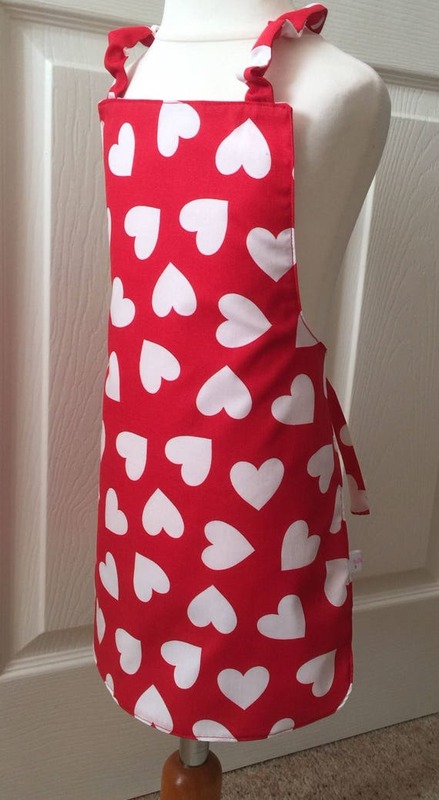 Apron is made with white love hearts patterned polycotton (52% polyester, 48% cotton) on a red background with plain pink polycotton on reverse, has elasticated neck strap and tie waist straps. Suitable for a toddler up to 3 years. Measurements: 44cm x 37cm. 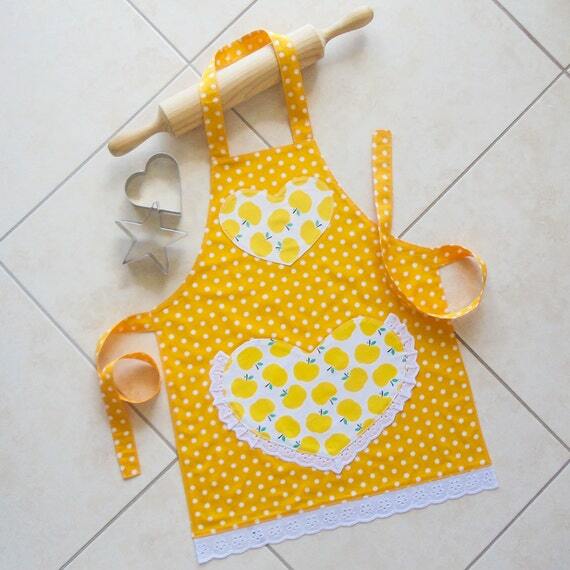 Perfect for a play kitchen accessory gift or for Mummy’s little helper! one side – Pink background with different colored hearts with a long blue polka dot pocket along the bottom. Ties & neck loop are adjustable for any size. Inquire for any mommy/daddy & me styles or made-to-order items. 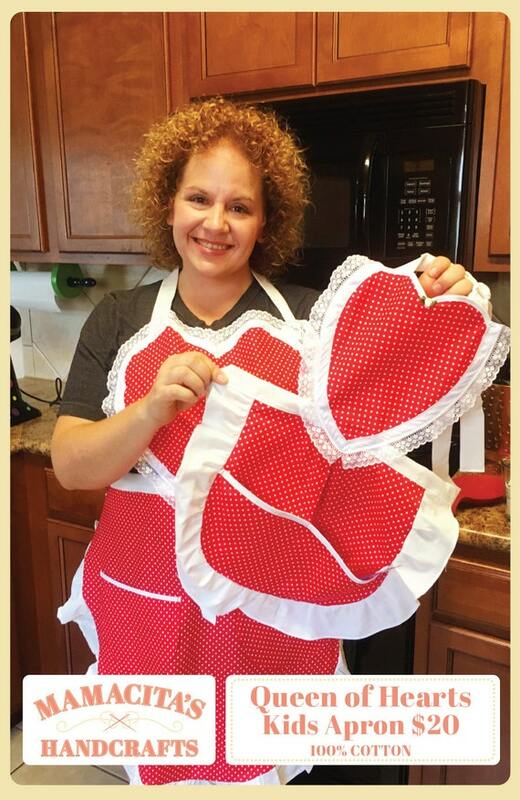 Any little girl will love to wear this cute retro-style apron while helping Mom in the kitchen or baking in her own play kitchen on Valentine’s Day or any other day of the year! 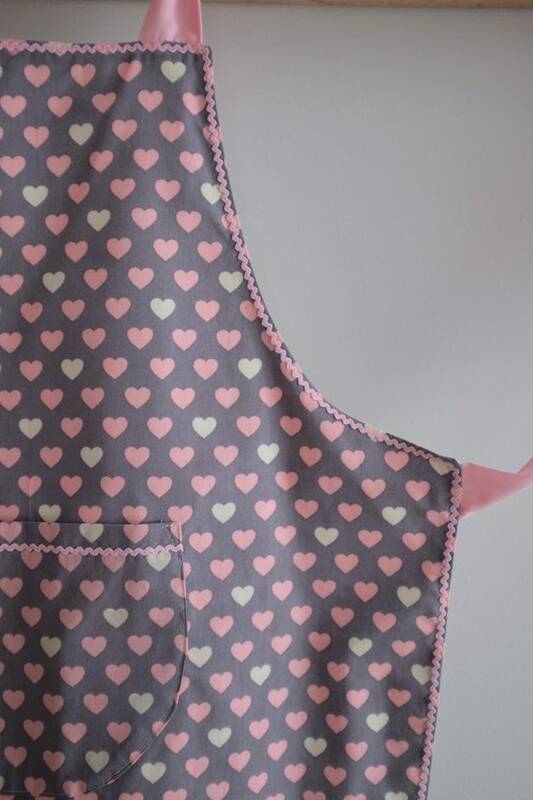 The main part of this apron has a black background with medium-sized hearts filled with tiny pink and gold metallic hearts. Gold metallic swirls surround all of the pink hearts. The three pockets, neck ties, waistband and ruffled hem are sewn from a matching pink and white polka dot fabric. All seams are zig-zagged and top-stitched for extra strength. Both fabrics are 100% cotton and have been pre-washed for your convenience. Machine wash in cold water/ gentle cycle and tumble dry low or line dry for best results. 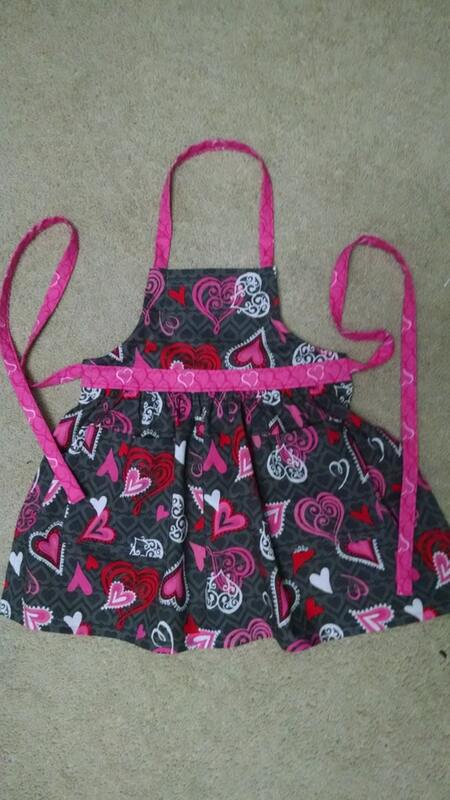 This reversible apron has pink hearts or multi shade of pinks option and will fit size 5-7. I can personalize with a name. The apron is 19 inches long and 16.5 inches wide. I sewed two double straps in beige grain white rice to tie around the neck and two double straps in the same fabric to tie around the waist. *Great gift idea for someone you LOVE! Pink neck and waist ties. Adorable finishing touches and trim. Perfect for your little helper in the kitchen or craft room. One large front pocket is great for stashing whisks, paintbrushues or coloring pencils. Each apron has ties to tie around the neck for a comfy fit. 100% Cotton Apron. Machine wash cold, tumble dry or air dry and iron. 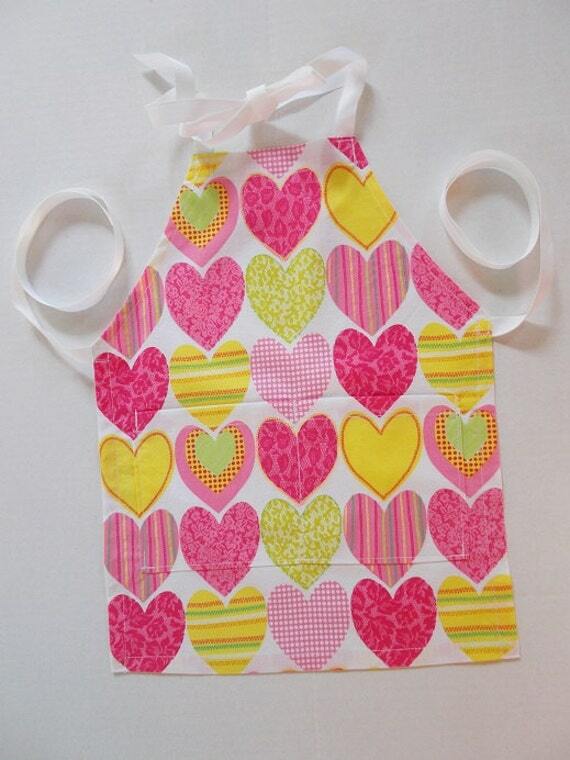 Half apron with pink and yellow heart prints. Hot pink polka dot waist with white lace trim on the pockets and bottom. Matching head band included! My mom is a seamstress from Vietnam and sews all my aprons for work. I’m a pastry chef and love to match my apron to every occasion! So many people have asked about my cute aprons so I decided to open up a little Etsy store for my mom. Everything is hand made by her loving hands and we pick the fabrics together! We can also do custom and bulk orders so please inquire! 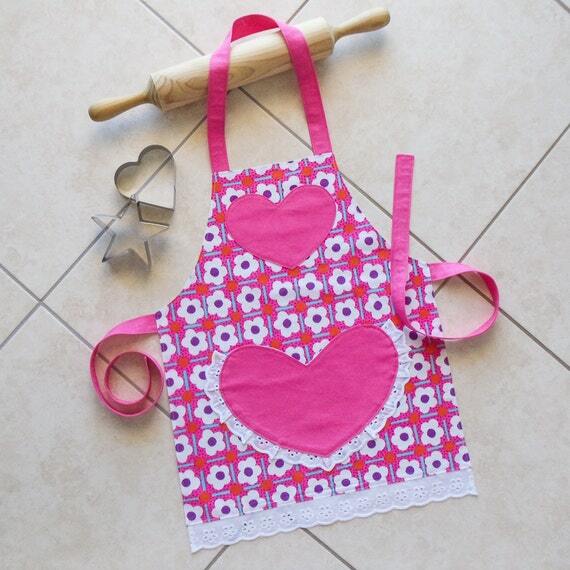 Cute kids apron for your special little helper in the kitchen! 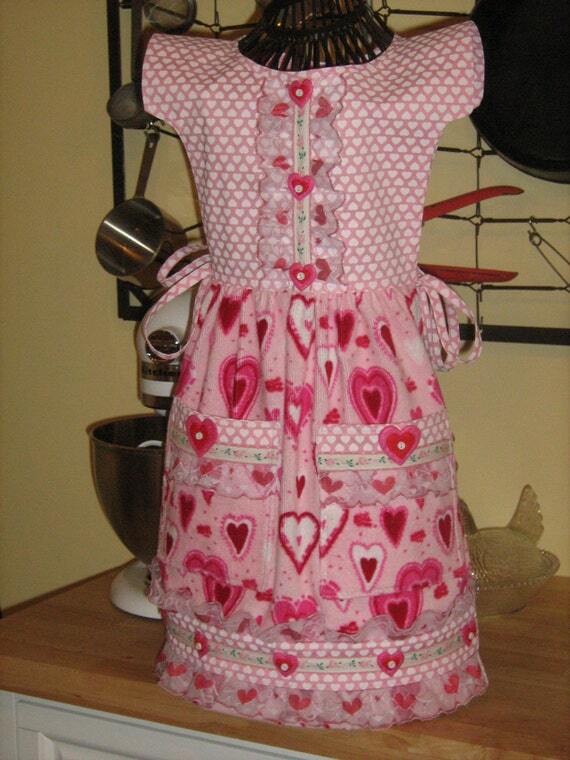 Full apron with pink and yellow hearts with pink polka dot trim and hand made ruffles. Comes with matching headband! Great denim apron for your sweetheart. Hand painted red and white hearts and coordinating grosgrain ribbon ties. Made from a large size woman’s denim jumper. Waist 17″ with long grosgrain ribbon ties, length 29″ excluding the grosgrain ribbon ties. You can order a smaller size for a child you love. Look at the mother daughter apron styles on my site. Great gift idea. Custom made to please. Apron-overall soft and modern at the same time, signed Mapluce. Creative soul, I imagined you apron: essential protection in the kitchen or for messy activities, the apron is a unique aesthetic dimension by the combination of colors and patterns here. Purple background hosts with sweetness of the Scandinavian pink, cream and grey fabric ties. Single Pocket receives two slightly sweatshirts hearts. It is cotton: basket weave cotton (fairly thick and textured) for United funds, ties and hearts applique pockets are in Poplin. Waist ties can be attached to the back but also on the belly as created long enough for that. Wash up to 40 °, if possible separate linen light first. Recommended ironing. This apron was made with love for your loved one with preloved jeans material. It is a little thicker than a normal apron and will protect their clothes from messy craft and play! The ABC grosgrain ribbon ties at the waist and is semi adjustable at the neck with ribbon. Should fit ages 2-7 well! This Apron is modeled on a 4.5 year old. 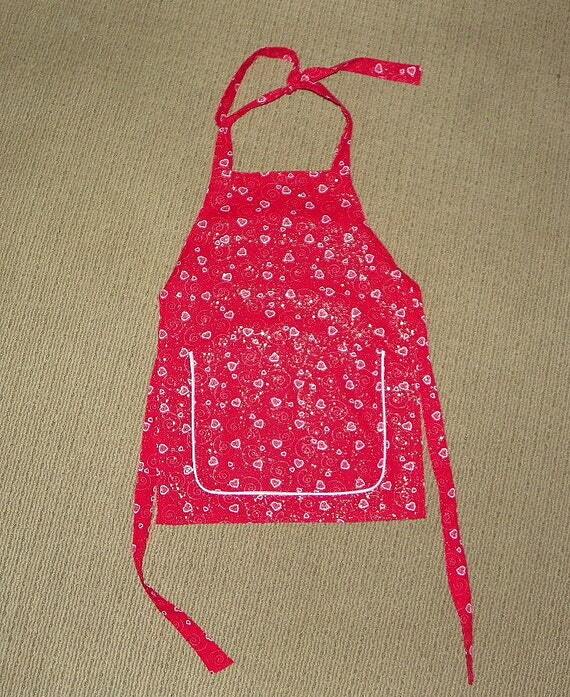 This is an adorable tiny little apron for the smallest cooks, approximate age 4 to 6 years old. It’s best to go by the measurements below, as children vary in size so greatly. The fabric is a quality shirt weight cotton with a print of hearts all over. The ties are polyester grosgrain ribbon. It’s sewn with cotton thread, reinforced stitching on the pockets and ties. The divided pocket is large enough to hold cooking or craft supplies such as crayons. 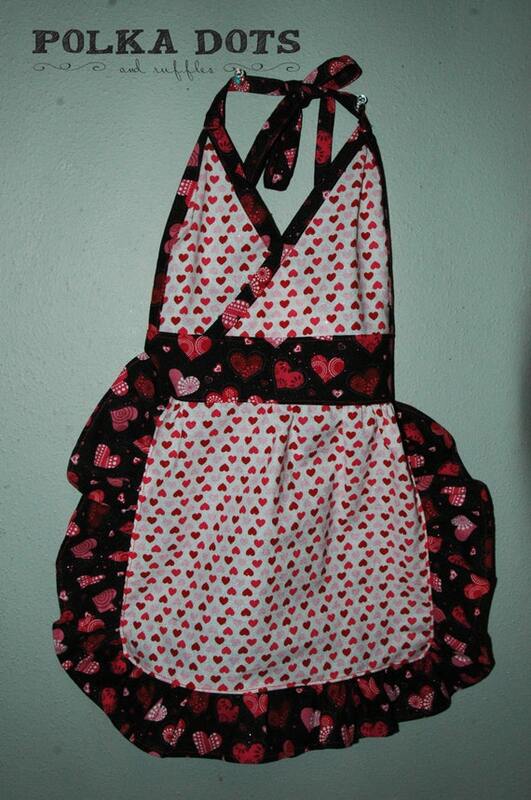 Child’s Terry Bib V-Day Apron. This is my own pattern design and creation. The apron slips over the head for easy on and off and ties on either side of the waist. 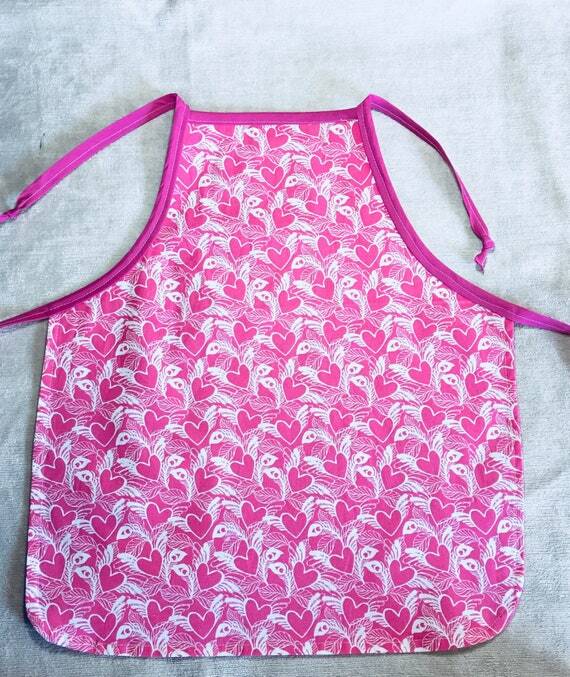 The bodice of the apron is in a soft pink/ white heart fabric. Heart lace trims the bodice, pockets and hemline. Topping the lace is a soft pink floral ribbon and heart stacked buttons. There are 2 oversized pockets. The bodice of the apron is fully lined. 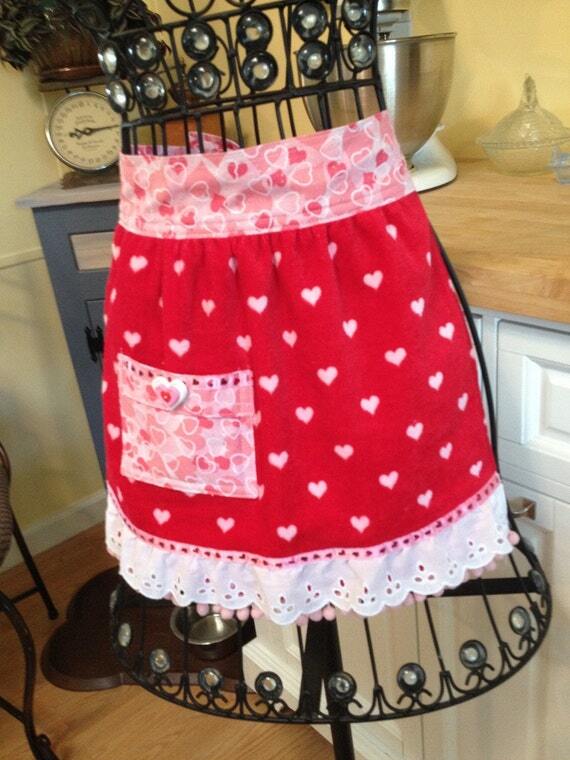 The skirt of the apron is in a heart Valentine’s Day print in terry cloth. Perfect Little Helper Childs A Style Apron, Hearts and Swirls, Makes a perfect accessory for the kitchen, cooking, baking, and craft activities. The Child Apron fits sizes 5-6. The pocket on the front of the apron measures 10″ wide and 7″ deep with a nice complimentary accent. 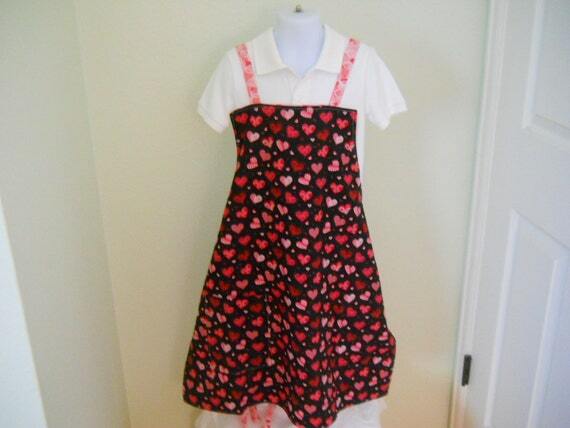 Red and white checker heart pattern apron for a child. Love pocket with green and yellow buttons. Green net embellishment with red apple button at neck.Ties at neck and back with adorable red cherries on yellow background. Perfect for pretend play or real cooking with Mommy and/or Daddy. Approx 22 inches in length and 12 inches wide with adjustable neck and back ties.